Inefficiencies exist, but there are steps you can take to improve how collaboration impacts your overall productivity. We constantly read that collaboration technologies can help us improve productivity. However, collaboration technologies can also be disruptive and distracting. How many times have you gotten a call or an email notice in the middle of working on a project? It can take a while to get back to work, and the interruption may even cause you to forget the comments you wanted to make related to your project. During this time you are less productive or unproductive, but changing collaboration behavior can make collaboration more efficient. The Webtorials report, "2017 Workplace Productivity and Communications Technology Report," based on responses from 906 business professionals from the U.S., the U.K., France, and Germany, provides a nice snapshot of workplace productivity as it relates to communications technology. About one third of the respondents work for companies with 2500+ employees, one quarter of the respondents work for medium-size companies between 500 and 2500 employees, and 42% work for small businesses with fewer than 500 employees. The report was financially supported by Mitel. The graphics in this blog are from the Webtorials report. Where Do We Spend our Collaboration Time? Study the chart below from the report. 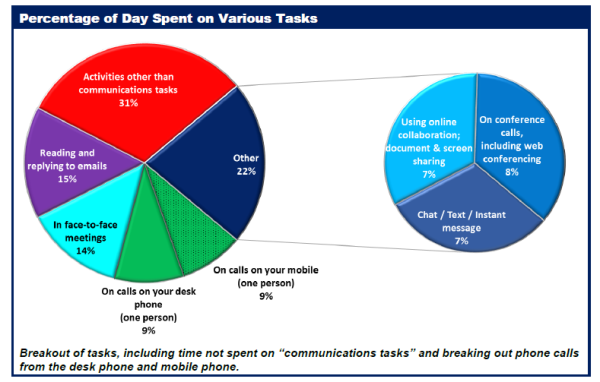 What may surprise you is that 31% of the time is spent on activities other than communications tasks. I would have expected reversal of time spent with 69% of the time spent in other activities rather than communicating. Sometimes I think we are over communicating and under producing. Another part of the report dealt with the impact of these inefficiencies on the workday. The report went through multiple tasks, as seen in the chart below. 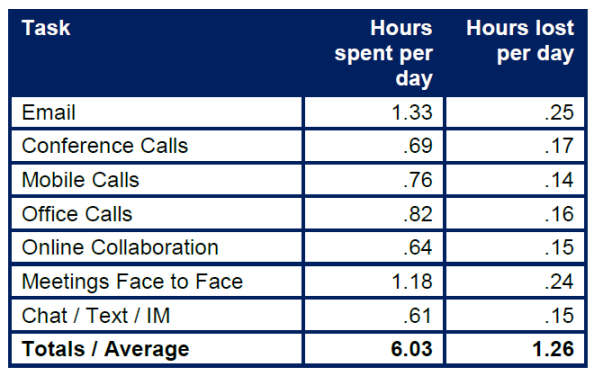 Report respondents said they communicated an average of 6.03 hours per day. When looking at the inefficiency of these collaboration tasks, a total of 1.26 hours was lost every day. The report went on to try to determine the financial impact of this lost productivity. The average worker in the study reported to be busy 43.96 hours each week. A number of assumptions were made with an end result of about $15,000 USD per employee per year is lost in inefficient collaboration. Does everyone invited to the collaboration event really need to be there? Consider videoconferencing rather than just straight audio conferencing. You may learn something by watching the speakers that you did not discern when you just heard their voices. It is nice to be sociable when you communicate. But social interactions, although important, are not the primary reason for communicating. Keep the social interactions to a minimum. You may want to finish the social interactions at the very beginning of any communications. Although social interactions may make you feel comfortable, they're not necessarily the goal of your communications. Do not stick to one media. Not everyone is equally comfortable with all the media. I found one case where someone wanted to instant message everyone else but not respond to phone calls, conferences, or emails. This is extreme behavior, and the person's management should work to change this behavior. This behavior appears to be selfish, inconsiderate of others, and arrogant. You would probably avoid collaborating with this person. Some other blogs on collaboration include, "Collaboration Is a Behavior, Not a Technology," "Where Are We with Team Collaboration?," and "Making Collaboration Work."